Slightly fruitier and lighter in calories than a traditional vinaigrette, this creamy dressing offers a nice tang and is especially great with peppery greens like arugula. 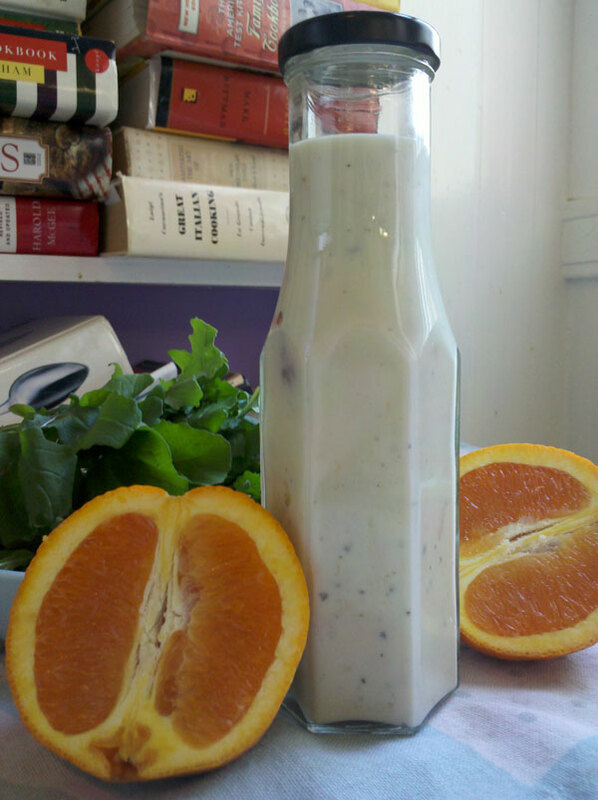 The beauty of this and other creamy dressings is that they stay fresh longer and may be used throughout the week. This dressing tastes particularly good when made with homemade orange marmalade, but of course a store-bought version will suffice. You’ll need a small clean bottle to store the dressing. Make sure it is free of rust and odors and the lid seals tightly. Prepare a label that lists the contents and date prepared. In the bottom of a large salad bowl or mortar, mash the garlic into the 1 teaspoon of salt until it forms a paste. Add the olive oil, and stir thoroughly until it emulsifies. Add the yogurt, lemon juice, and marmalade, and stir thoroughly to combine. Season with pepper, taste, and adjust as needed. How to Store It: Refrigerate, covered, up to 5 days. Exceprts reprinted with permission from Jam It, Pickle It, Cure It And Other Kitchen Projects by Karen Solomon, copyright © 2009. Published by Ten Speed Press, a division of Random House, Inc.